Turkey matters again? Guys, get your story straight! “Stocks Fall After Thursday’s Rally as Turkish Lira Resumes Decline,” said a CNBC alert just after the open today. But it matters again today. If you’re a newer reader and you have a sense that these clowns are just reaching for explanations behind day-to-day market noise… you’re absolutely right. So let’s step back from the noise this morning. Let’s look at where we are and where we’re likely going. At last check the S&P 500 is flat this morning at 2,842 — about 1% below its all-time high reached on Jan. 26. What does that mean? Here’s what it doesn’t mean: “Record-high stock prices don’t mean we’re reaching a top and heading for a fall,” says Alan Knuckman — our eyes and ears in the Chicago options trading pits. Yes, companies can perform accounting tricks to make earnings look better than they really are. But for our purposes today, that’s not the point. Alan says he learned the most important investment secret of all from his parents when he was little. “If you’ve ever paid attention to labels at a grocery store,” he says, “you may know that almost every item has two prices — what the item costs, and what the item costs per pound or ounce. “In the end, that’s how the P/E ratio works. “Say you are looking at the stocks of two grocery store companies. One is selling for $8 and has a P/E of 4, while the other trades for $10 and sports a P/E of 2. “Yes, $10 stock might cost more, but you are getting more value. The P/E of 2 means you are paying $2 for each dollar of the company’s earnings. With the $8 stock, you are paying $4 for those same earnings. You can look at the P/E for an individual company… or for an industry sector… or even the stock market as a whole. So… for the market as a whole, are stocks still a good value? Right now the forward P/E for the S&P 500 sits squarely on the long-term average. “This is a big deal,” says Alan, “because earnings have been well above average. So far in 2018, more than two-thirds of the S&P 500 companies have beaten their earnings estimate. 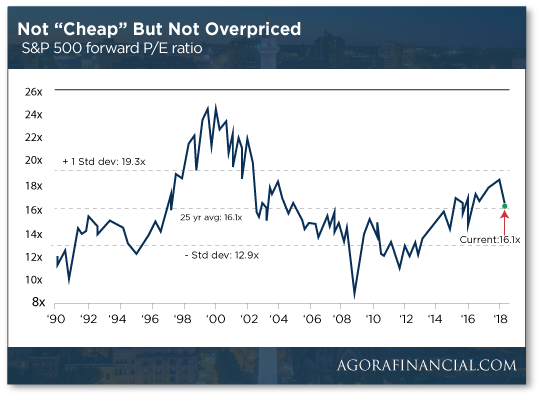 Yet the market’s P/E ratio hasn’t grown out of control, meaning stocks are not overvalued. [Ed. note: Clearly Alan thinks you’ll be OK if you take a “buy and hold” stance in the markets for the rest of this year. But if you’re looking to make really big gains in an even shorter time frame… he has a proven strategy to do just that. “It’s natural to be skeptical about the bull market,” chimes in Alan’s colleague Zach Scheidt. Not so, the way Zach looks at it: “One of the ironies of the market is that the majority of individual investors get it wrong… especially at the most critical turning points for the market. Investors will buy most aggressively when they feel comfortable with the market. And when everyone buys, prices go higher. “That is, until there’s no one left to buy. But that’s not where we are. 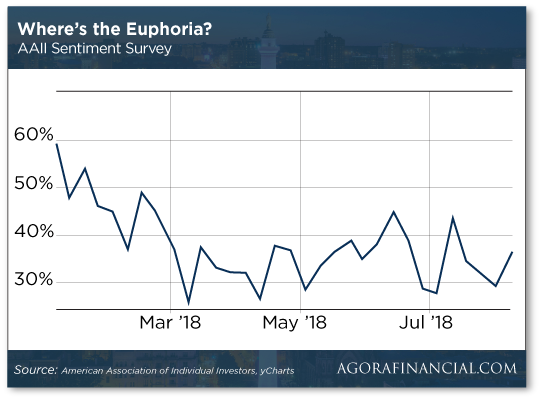 Zach directs your attention to this chart: “It’s from the American Association of Individual Investors and it shows how optimistic the average investor is right now. “The chart shows that less than 40% of investors consider themselves ‘bullish,’” Zach explains. “This is much lower than the 60% who were bullish at the beginning of the year. “When people have their money on the sidelines, that’s not when markets turn lower,” Zach elaborates. Once the S&P 500 punches through that Jan. 26 record, “we’ll start to see this trend ramp higher. Which means we’ll cross through 40% into the 50% and possibly even 60% of investors who consider themselves optimistic. “When this happens, that’s a great time to start being more conservative and taking gains off the table. Gold languishes just above $1,175 an ounce… but the worst is over for now if Jim Rickards’ experimental new gold indicator is right. As we explained last month, gold priced in special drawing rights — the super-currency issued by the International Monetary Fund to governments and central banks — has been trading in a tight range for nearly two years now. In that time, the Midas metal has seldom gone above 950 SDRs… or below 850 SDRs. Jim says the likelihood of that happening by chance is “infinitesimal.” He theorizes the IMF is working hand in hand with the Chinese central bank to help Beijing build up its gold stash at attractive prices. Yesterday gold priced in SDRs fell to 851.5 — right near the bottom of the range. If Jim’s indicator is on the money and you’re not done building up to his recommended gold allocation (10% of your total portfolio), now’s the time to buy. OK, this could get interesting — a lawsuit accusing Facebook of inflating its user numbers. Analysts have been questioning those numbers long before Facebook went public in 2012. But now the owner of an online business based in Kansas has filed suit in FB’s backyard — the Northern California federal court district. And she’s seeking class action. At issue are the “Potential Reach” numbers for how many users are targeted by an ad. 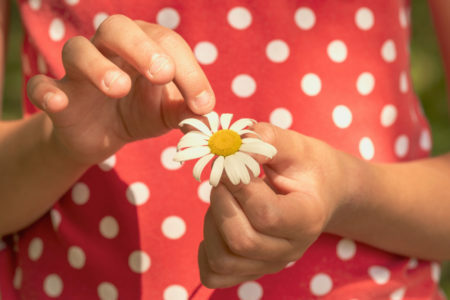 If the numbers are higher, advertisers are naturally inclined to buy more ad space. “The lawsuit from owner Danielle Singer alleges that Facebook’s purported Potential Reach figures for the 18–34 age demographic in all 50 states exceeded the actual population of 18–34-year-olds who use Facebook,” reports the San Jose Mercury News. We’ve encountered that allegation before in the financial blogosphere. But this is the first time it might be tested in court. Grab the popcorn. Tesla shares have tanked more than 8% today after founder Elon Musk’s train-wreck interview in The New York Times. But he did little to assuage concerns about his, uhhh, flaky conduct this year. Especially when he addressed his tweet last week about an offer to take Tesla private at $420 a share. “But I was not on weed, to be clear.” He does, however, fess up to taking Ambien at times. 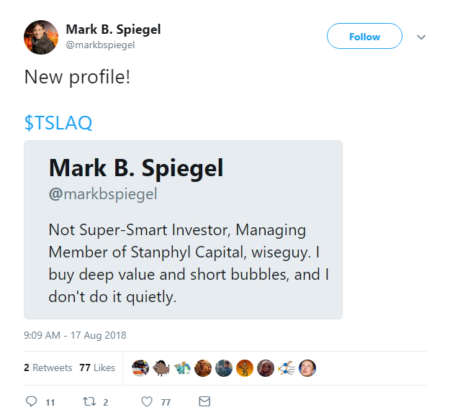 Heh — one of the most notorious Tesla shorts just changed his Twitter profile this morning. “Good on you for publishing the reader chastising Rickards’ miss on gold forecast so far!” a reader responds to our Tuesday mailbag. “You will rarely see that kind of integrity elsewhere! “I think the gentleman should not look at gold as how much money he thinks he will eventually make, but purely as catastrophe insurance. “Right now gold looks to be on sale. “All of the countries that are slowly, at first, dislodging the dollar monopoly are replacing it with gold. “I do agree with Jim, as well as the Axis of Gold countries, that eventually fiat currencies will fail and the only thing that will restore faith is gold and silver. “In that instance, if you don’t already own physical gold, it will be too late. You won’t be able to buy it at any price. “Let’s see,” the reader goes on, pointing to recent developments we’ve spotlighted… “Funds selling off their gold and changing their objective, readers angry about how low the price of gold is, fiat currencies imploding around the world with new members like Turkey being added regularly, etc. “This sure feels like a contrarian’s dream! The 5: Thanks for chiming in (and putting in a good word for us). We can’t verify Rogers said those exact words, but it totally sounds like something he’d say! Click here and James will explain what’s in it for you.